A damaged communication tower situated in Devou Park near the Children's Home of Northern Kentucky will need to come down, forcing an evacuation and safe zone to be created. The tower was damaged when a tree fell on it Friday, The River City News was first to report. Some of the tower's guide wires were damaged, compromising its structural integrity. The tower is part of the emergency communication system in Kenton County. After reviewing options, Kenton County Judge/Executive Kris Knochelmann ordered that a temporary tower be installed to minimize interruption to 911 radio communications, a news release said Monday. Residents and staff of the Children's Home were evacuated from the site Friday, it was announced late Monday evening. See further details about that below. The tower is demolished by explosives on Tuesday between noon and 6 p.m. Holes on the Devou Park Golf Course within 450-feet of the site will also be closed during that time, Kenton County Administrator Joe Shriver said. 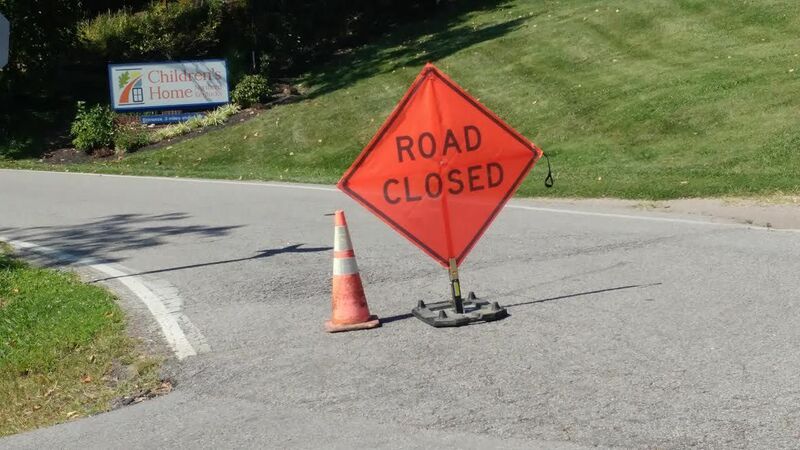 The road leading up the Children's Home will be closed, just as it was over the weekend. Meanwhile, residents of River's Breeze in Ludlow will need to stay indoors and stay away from windows from noon to 6 p.m. Those residents will be contacted directly, the county said in a news release. Shriver described the River's Breeze situation as a "shelter-in-place". The Children's Home of Northern Kentucky began an emergency evacuation of clients and staff from the campus’s three residential buildings and administration building on Friday when it was revealed that the tower's structural integrity had been compromised. Clients and residential treatment team members relocated to CHNK’s Burlington campus while administrative personnel were moved to the agency’s Deaconess Health Check location at 525 W. Fifth Street in downtown Covington. CHNK also canceled a gathering of major donors who were scheduled to come together that evening to celebrate the 199th birthday of CHNK founder Colonel Amos Shinkle. Simultaneously, CHNK contacted Kentucky’s Department for Community Based Services (DCBS) and all parents and/or legal guardians of current clients to notify them of the situation and to confirm the safety of the youth. Faculty and staff of Covington Independent Public Schools’ Transformational Learning Center, which operates out of CHNK’s Devou Park campus, were also notified in light of the fact that classes resume next week. Despite the interruption to CHNK’s main campus, all programming and daily operations continue to move forward on its other two campuses, thanks in part to supportive community partners who pivoted quickly to assist the agency with these alternate, temporary accommodations. The timeline for returning to the Devou Park campus is fluid, as it depends on the demolition and removal of the tower. Structural engineers advised that the tower is not salvageable, based on observable damage and the tower’s age. Demolition of the tower is scheduled to take place on Tuesday, August 15 between approximately 12:00 noon and 6:00 p.m.
“CHNK staff members and professionals from the community are prepared to immediately inspect the campus and its facilities following the tower’s demolition, to make certain that children in our care and our staff members are returning to safe conditions,” CHNK Chief Strategy Officer Julie Raia said. In the meantime, individuals needing to contact CHNK can continue to do so by calling the agency’s main number at 859.261.8768 or by emailing [email protected]. Updates about the re-opening of the Devou Park campus will be shared on CHNK’s Facebook page (CHNK1882) as they become available. The River City News will have more details on this developing story as they become available.